SELECT "ORIGINAL" UNDER AT LEAST ONE IMAGE SO THAT YOU MAY VIEW THEM IN A 1:1 FORMAT. When you scan BW in higher resolution you see more film grain. 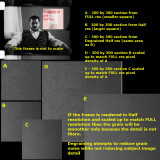 De-graining is a attempt to selectively filter areas judged not to be part of camera subject image content (film grain). If you up-scale a lower resolution image to match the size of a higher resolution image you will see less grain (and less image detail).